Mars Water‘s foliow-up album to its July release is a curious thing. The band started as a monthly song writing project of Ponny Kosmas in 2011, which later evolved into a full-pledged band under the name Mars Water�a combination of Kosmas’ interest and fear in both astronomy and the ocean. Packed with a hefty set of 11 songs, Mars, Je T’aime is a concept album about a long distance love between a woman in France and a man in Mars. The songs in the album are letters between the lovers. Spacey vocals and acoustic strings set the overall mood in Wait For Me. While Somewhere Nice follows with an upbeat, summer vibe. The sudden shift between these two songs paints a stark contrast between the distance of the two characters. When I Saw You is a love child of the first two tracks as it perfectly combines the ambient sound of the first track and sunshine charm of the latter. Tracks such as Penser�� Toi, Philippe, and Attente features the effortlessly soothing vocals of Eva Kosmas. The arrangement of each tracks bursts with French appeal that will easily transport the listeners to the place. Getting Married and The Wind concludes a happy ending for the distant lovers as they finally walk down the aisle. 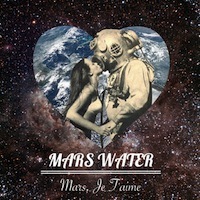 In Mars, Je T’aime, Mars Water has succeeded in transforming a love story into exquisite pieces of music that are easily digestible.